Yesterday, I talked about how I structure my prayer time. Today, I want to explain the system I use to keep track of prayer requests. 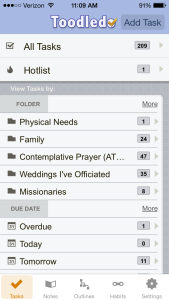 For years I searched for a tool that would help me to organize my prayer life. I felt that I needed to be faithful in praying for others, but how do you manage so many names? Some people do it “on the fly”, from memory or as God brings people’s names to mind. Others are more proactive and make lists. I’ve tried just about every system imaginable: index card file boxes, paper printouts, dog tag lists, Palm Pilots, Google Docs, etc. I just wanted to find something that was flexible, customizable but easy to use, and backed up online. I even tried some prayer apps, but none of them did all the things I wanted. 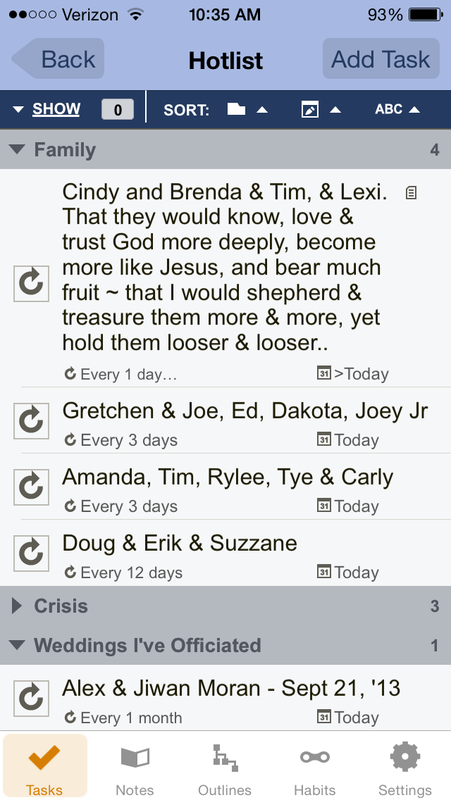 Until someone told me about Toodledo, the perfect app for managing my prayer requests. 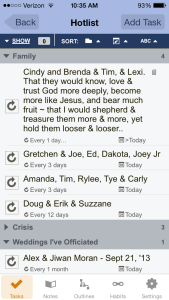 Toodledo is designed to be a task organizer, but it works perfectly well as a Prayer organizer. Once you set up an account at www.Toodledo.com , you simply download the app, log in and you’re ready to go! You can set up different folders to separate your requests into categories. You can arrange these folders in any order and there is no practical limit on how many items can go in each folder. 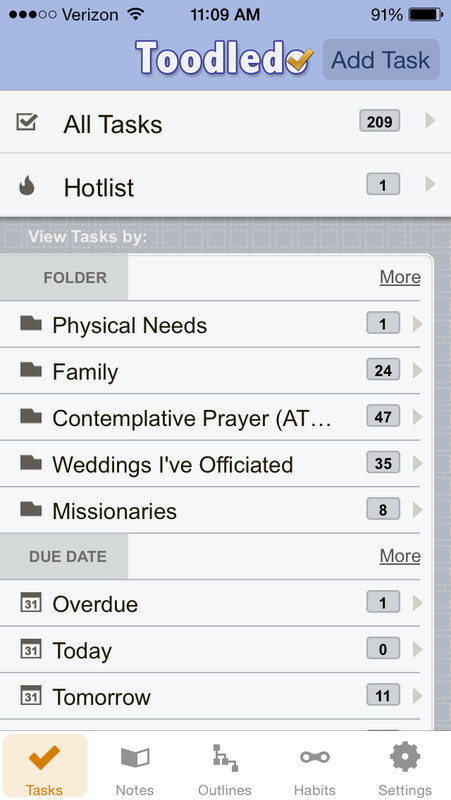 Within a folder you can easily create tasks, which in my case are prayer items. After they’re checked off, you can set them to reoccur at whatever interval you want. For example, under “Family” I have some requests that repeat every day. Others, such as my New Jersey family will pop up on my list every three days, alternating days with the Hoobler family and the Forstroms. Extended relatives will pop up less often (say, every 12 days), but always appearing on the same day as my closer relatives from that family. I try to pray for the couples I’ve married once a month, always on the anniversary of their wedding. 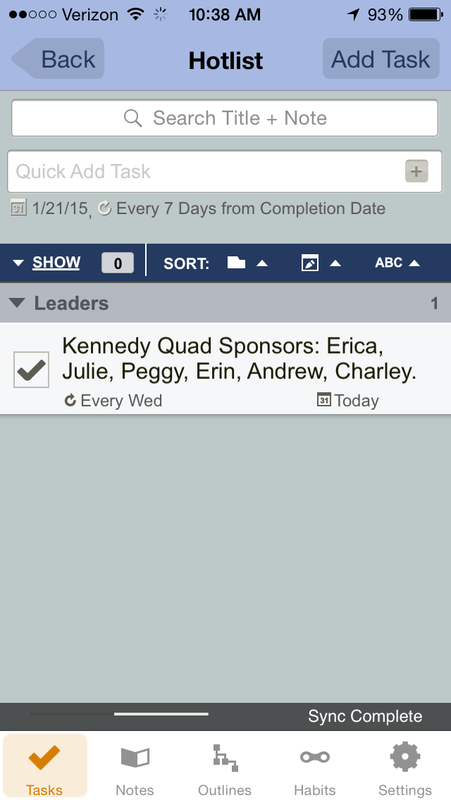 Toodledo allows me to set up a monthly, repeating task on a specific date, such as the 21st. of each month Or as you can see below, a request can pop up faithfully every Wednesday. Once you’ve checked off an item, it disappears, but then magically reappears whenever it’s scheduled next. I love this next feature since I tend to miss days now and then. Tasks can be set to reappear on a predetermined calendar schedule or they can reappear so many days after the last one was checked off. That way if you fall behind in prayer, you don’t have to worry about requests piling up endlessly! The urgency of the request combined with the proximity of the person to me determines how many days I set between repeats. One repeat could be “every 57 days from checkoff.” I try to find what’s reasonable for the situation. It may not be often, but I can honestly say, “I pray for you regularly”. You can also add notes to any prayer item, which is nice if you want to copy and paste prayer updates from an email. Or you can make the task a topic, such as “People battling cancer” or “Grievers” and the note can contain the names of people to whom it applies. Finally , you can set up a “Hotlist” to immediately access the list you want when you open the app. My “Hotlist” is set to show all tasks that are either due today or are overdue. 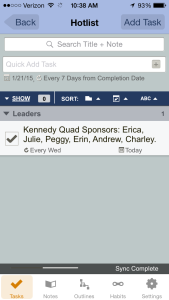 Are you using the tasks or habits feature?